The debate around Negriʼs more recent book Empire, co-written in English with Duke University academic Michael Hardt, makes a rereading of Insurgencies a useful exercise at present. The latter is also part of the body of ʻlater workʼ widely criticized within the post-autonomist tradition, but it focuses more on a critique of state-form in relation to value-form than on the presumed link between ʻimmaterial labourʼ and proto-communist ʻmultitudeʼ, which is arguably the weakest element of Empire, as well as Negriʼs earlier collaboration with Hardt, Labor of Dionysus (1994). Critics of Empire (and of Negriʼs other recent writing) argue that in isolation from ʻthe movementʼ he has fallen prey to an unjustiﬁed optimism and bornagain technological objectivism with no empirical basis in social reality since the 1970s. For Aufheben (no. 10, 2002) the indeterminacy of ʻmultitudeʼ as subject abandons ʻthe notion of the proletariat as the universal class capable of grasping and transcending capital as a totalityʼ. This dereliction is linked to the ex-autonomist ʻwhite overallsʼʼ recuperative mediating practice in street confrontations. In Radical Philosophy 103 John Kraniauskas regards the ʻhybrid constitutionʼ presented in Empire as both the immanent form of global sovereignty and the only possible terrain for revolutionary praxis ʻsocially abstract and temporally homogeneousʼ. ʻTo reduce a concern for other times to “nostalgia”ʼ, he warns, ʻwould be to re-impose the narrative of development – that is, the abstract time of imperial capital – in the guise of revolutionʼ (p. 37). George Caffentizis of Midnight Notes comes closest to synthesizing these positions in the image of Negri ineffectually ﬂinging ʻtheological cursesʼ at an indifferent capitalist machine. Insurgencies remains of interest in this context because, in separating Negriʼs reading of ʻthe alternatives within modernityʼ from its technologically deterministic conclusion in the triumph of ʻmultitudeʼ and ʻimmaterial labourʼ, it justiﬁes asking whether his historical analysis may yet be of use to a more robust re-conception of ʻpostmodernʼ class antagonism. transport workers, and ʻproletarian shoppingʼ – mass festive looting of supermarkets. Yet although Negriʼs writing of the last twenty years has diverged from this tradition, a residual continuity is unbroken. Insurgencies remains grounded in revolutionary praxis to the extent that it provides an ontological surface onto which the autonomist image of labour-subjectivity can be ʻmappedʼ. The problem is, what can this conceptual mapping contribute to the recomposition of an antagonistic subjectivity all but shattered by thirty years of successful capitalist counter-revolution? 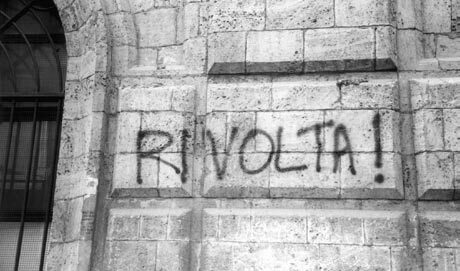 The ﬁve central chapters of the book trace a continuity of social conﬂict through Machiavelliʼs Italian city-states, then the English, French, American and, ﬁnally, Russian revolutions. In each of these episodes the ʻconstituent powerʼ of immediately political labour engenders a crisis in the order and apparatus that captures, contains and exploits it (ʻconstituted powerʼ). Each conﬂict is ʻresolvedʼ in an enforced compromise, a new mode of capture: power is constituted once again, class subjects are recomposed at a new level of tension. Revolutionary ʻvictoryʼ generally means settling back into latent hostility after an interlude of open warfare, presumably with the subaltern side enjoying more strategic autonomy than before. This selective narrative of the modern period traces a tendency which traverses and gives sense to the Italian, English, American, French and Russian episodes. The ʻconstituent principleʼ itself is deﬁned as ʻcontinuity of crisis between social productive strength and state legitimationʼ. In reality there can be no alternation between emergency and normality, for there is no normality, only perpetual reinvention of crisis. Modernity appears as a series of attempts by haphazardly constituted powers to mediate the upheaval generated by the productive force on which their own expansion depends. This narrative of revolt as constructive social agency culminates in Marxʼs account of the industrial proletariat. ʻCapitalist realityʼ is the only ʻtotality of modernityʼ from which constituent power can be liberated. In his account of the genesis of the capitalist state Marx ʻconfronts the riddle of the originary, constitutive violence of the social and political orderʼ. The violent appropriation of labour – the meaning of ʻaccumulationʼ – is naturalized as law at its point of greatest intensity. Right is ʻthe immediate superstructure of violence and its reﬁnementʼ: the rising bourgeoisie needs the coercive power of the state ʻto regulate wages, to lengthen the working day, and to keep the worker himself at his normal level of dependenceʼ. Thus law (or constituted power) appears as ʻa sort of average level of violence that overdetermines every social relationshipʼ. This process not only produces commodities and surplus value but reproduces the capital relation itself, the functions of capitalist and worker as such. Constituent labourʼs struggle for self-subtraction from constituted command implies an increasing convergence of ʻthe socialʼ and ʻthe politicalʼ. The political, which the classical age had conﬁgured through social orders, and modernity saw in terms of representation, is wholly absorbed into the dynamic of cooperative production. For Negri the materialism and the ʻcreative strengthʼ of Marxʼs thought lie in his insistence that the abolition of ʻthe politicalʼ as an idealized separate category would ʻmake it live as a category of social interactionʼ. In the light of this discovery the experience of the USSR cannot be regarded as the historical anomaly, the essentially meaningless nightmare to which postCold War narratives (whether triumphalist or melancholic) would reduce it. For it was in Russia that the full subsumption of the political under the social was ﬁrst played out in painful reality. In fact the process has yet to be pushed as far elsewhere, as the survival of Western parliamentary ʻdemocracyʼ as a self-sufﬁcient and trivial spectacle, detached from global administrative apparatus and productive machinery, goes to show. Within the USSR the ʻreformist practice of capitalʼ  confronted the constituent power of the soviets (for as long as the latter survived) without the distorting mediation of a separate ʻpoliticalʼ sphere. Capital ʻdraws precious teachingsʼ from the form of the sovietsʼ institutionalization. The soviet is integrated in the state ʻas participation in the organization of production, as support of the ideology of labour, as instrument of planningʼ. Western capitalism has long since staked its survival on a similar incorporation, materially rather than politically recuperating the ʻworker variableʼ by involving worker subjectivity in the organization of labour itself, always according to ʻcapitalist ﬁnalities of productionʼ. New Deal/Keynesian planning secured this compromise: in exchange for higher wages and recognition of labour as social protagonist, workersʼ ʻrepresentativesʼ in trade unions and social-democratic parties delivered rising productivity and acceptance of the horizon of capitalist expropriation. A new phase of incorporation arrives with ʻpostindustrialʼ society, in which workers employed in ʻimmaterial labourʼ are granted an unprecedented degree of individual and collective control of the productive process, in exchange for an unreserved investment of (individual and collective) subjectivity in the business of accumulation, a commitment amounting to a 24-hour working day. Negri and other post-autonomists have repeatedly argued that capital was forced to adopt this latest strategy by sustained proletarian pressure too strong for the social-democratic settlement to contain. Eventually there was no longer any room for ʻcommunism within the strictures of capitalist planningʼ,  no use for the mediation of ʻcivil societyʼ:7 the only possibilities left are subsumption without remainder of social life in the capital relation, or irreversible rupture of constituent from constituted power, detachment of all activity from the time-measure that prepares it for exchange. Yet in spite of all this, Negri declares in his ﬁnal chapter that we are ʻbeyond Marxʼ. This is an unsettling gesture, since it is Marx who ﬁnds in proletarian labour an adequate embodiment of constituent power and creator of ʻthe general social conditions through which it can be expressedʼ. The claim that Marxʼs theory of the working class as historical carrier of constituent power ʻhas now reached its historical limitʼ has understandably led to the rejection of Negriʼs recent work within ʻthe movementʼ from which, as an intellectual celebrity in Parisian exile, he was cut off. However, the implications of such statements may not be as simple as they seem; in fact they may allow the authorʼs analysis to be applied beyond the limits of his presumed intention. It is not clear whether Negri is arguing that the proletariat per se is ﬁnished as a bearer of constituent power, or whether the ʻhistorical limitʼ is that of Marxʼs particular formulation, which speciﬁed the waged industrial working class as privileged revolutionary subject. The former option might appeal to ʻcommon senseʼ, but it presents certain problems. To say that the proletariat is no longer an adequate bearer of constituent power would imply a preference for some other subject, but no such alternative is proposed in the book. ʻConstituent powerʼ certainly cannot be made to stand as a subject ʻin itselfʼ, taking the place of any more speciﬁc ﬁgure. As the Italian, English, French and Russian episodes demonstrate, ʻconstituent powerʼ is a function, a property which throughout history particular collectives have attained, embodied, then relinquished in allowing their hegemony to take constitutional form. Therefore for the term to name a real subject is impossible; to call the bearer of constituent power itself ʻconstituent powerʼ is absurd. The refusal to name a new constituent subject for a world ʻbeyond Marxʼ leaves only one way for Negriʼs argument to be made to cohere. Since the 1960s, capital has fended off the threat posed by waged industrial workersʼ subversion of the Keynsian settlement by simultaneously undermining those workersʼ economic power and their composition as a collective subject. However, the defeat and dissolution of one group of workers does not mean either the ﬁnal triumph of capitalism, or that anyone other than the proletariat (in Bordigaʼs sense of a class ʻwithout reserveʼ), with no accumulated labour to fall back on (only the capacity to act as producer and destroyer) can be relied on to overthrow it. An adequate theory of the transformation of production, the spread of an immanent, intimate form of exploitation, is a necessary (but not sufﬁcient) condition for the emergence of a proletarian constituent power capable of achieving autonomy. Negriʼs identiﬁcation of this subject with the ʻimmaterial labourʼ of information workers in ʻadvancedʼ countries (also exalted by less subtle post-autonomia cyber-converts such as Maurizio Lazzarato and Franco Berardi)  has been criticized from a variety of perspectives. Disappointingly, the same evangelical strain is barely moderated when it reappears in Empire. The usefulness of Insurgencies, on the other hand, may lie in the fact that, instead of rehearsing this argument once more, it provides criteria with which the contours of a constituent ʻpost-industrialʼ proletariat could be traced, leaving open the possibility that the reader may perceive a ﬁgure very different from the one the author may have had in mind. The same section invokes an irreducible antagonism between any constituent subject and the juridical state apparatus which normalizes and guarantees accumulation. This might seem obvious, but ungainly abstractions are used for a very concrete reason. Insistence on ʻprocedure/process against the deductive mechanism of substantial rightʼ as such amounts to an attempt to extend the confrontation beyond the self-parodic remnants of national legislative ʻpoliticsʼ (whose withering is misidentiﬁed by glib theorists of ʻglobalizationʼ with a simple decline of ʻthe stateʼ) to the supranational ʻadministrativeʼ bodies whose sovereign decisions function on a de facto constitutional plane. (The binding supra-political nature of WTO rulings, euro stability pact obligations and EU commission directives are perhaps the best-known examples of this phenomenon; the Hague Convention aims to deepen this virtual ʻstate of exceptionʼ to an unprecedented degree). To develop the critique of these supra-national state-forms in their speciﬁc relation to capital is Empireʼs strongest aspiration. The analytical scope and ﬂexibility demanded by such a project are established in Insurgencies, with the insistence on an essential relation between capitalist ʻeconomicsʼ (as ideology and practice) and the representational form of ʻpoliticsʼ (rather than any one of its historical appearances, such as national parliamentary ʻdemocracyʼ). In Negriʼs reading of Emmanuel Sieyesʼs bourgeois revolutionary manifesto The Third Estate, ʻthe concept of political representation … is essentially tied to the division of labourʼ. Mediation is the characteristic element of a ʻlaborious, uniﬁed and compactʼ commercial society. Sieyes attempts to naturalize these transactions, warding off ʻusurpationʼ either by traditional social orders or the ʻbrute democracyʼ of non-negotiable labour, by claiming that only the divisions of representative government properly reﬂect those of ʻmediated (social) competitionʼ. In other words, the division of labour mediated by money is projected into the artiﬁcially separated ʻrepresentativeʼ sphere. Negri calls Calhounʼs position ʻradically appropriativeʼ, in that a nonrepresentational concept of democracy dependent on antagonistic subjectsʼ material power is preferred to the constitutionalistsʼ contractual model, modelled on the ideal obligation that guarantees commercial transactions. Paradoxically, the ʻcommunistʼ authorʼs extended use of the racist ʻconservativeʼ Calhoun as an example maintains the argument in at least a virtual relation to class conﬂict. Especially in Empire, the concept of ʻexodusʼ (borrowed from St Augustine, Spinoza, and Negriʼs Italian contemporary Paolo Virno) could seem to imply a quietistic withdrawal from social confrontation, a desire to create little islands of ʻfairnessʼ within present conditions. The fate of Calhounʼs doctrine, however, bears witness to the fact that secession from a constituted order cannot be achieved peacefully. This insistence that ʻexodusʼ means appropriation of social wealth by a determinate subject, and hence proposes the destruction of the constituted order from which that subject ʻsecedesʼ, emphasizes the falsehood of the premisses in the recurring leftist debate between ʻanarchisticʼ constructive withdrawal and socialistsʼ (and, more recently, NGO liberalsʼ) institutional engagement. The temporal component of the ʻconstituentʼ assemblage returns us to the idea of a ʻcounter-traditionʼ haunting the institutions of modernity. No one has gone further than James Harrington in conceptualizing this latency. His attempt to give social, material content to the English revolution was defeated by the gentry in successive alliances with the yeomanry and the industrial bourgeoisie. Yet he demonstrates that ʻconstituent power can live beyond its own temporal defeat … as latency that traverses a world … where unjust social relations have triumphed … a world that will be destroyed by the constituent power of the multitudeʼ. The historical cases covered by the book show again and again how new institutional arrangements, instances of constituted power, are able to take over from the orders preceding them thanks to the constituent action of a multitude which must subsequently be contained in order to stabilize the new constitution. This containment is the ʻdefeatʼ of the constituent subject, yet the latter persists as ʻlatencyʼ in a double sense: the recent social mutation, the new reality, is due entirely to its action, and it never stops seeking to break out of its conﬁnement, to rise up again, refusing the new restriction of its freedom. (Hence the vigour with which ʻrevolutionaryʼ governments, safely established as constituted power, act to hold down their ʻownʼ constituent multitudes.) When Negri asks whether ʻthat concept of “latency” … [is merely] the representation of a project that is not only defeated, but also deﬁnitively consumedʼ, the response can only be a complex one. In its ʻlatentʼ form constituent power at least retains the practical and ontological ʻopen-endednessʼ that distinguishes it from constitution, in which, by contrast, particular cases are deduced mechanically from a given law (in the capitalist world, that of value). But of course this openness is useless if the constituent subject cannot act to determine the disjunctive course of history. Therefore, the task for practice and theory is to discover how a constituent subject can act as historical protagonist without allowing its labour to accumulate, its power to be constituted as law. Negriʼs writing on Harrington contains one almost submerged indication of an area in which future work might discover an effective approach to this problem. The seventeenth-century revolutionaryʼs thought on ʻlatencyʼ, he observes, ʻmarks a revival of Protestant ascesis in its most radical and even theologically founded dimension … constituent power as a sacred movement of renovatio, as an ever open possibility of the revolutionary processʼ. To what does this ʻascesisʼ refer if not to the same thing which at the end of Insurgencies Negri mysteriously insists on calling ʻlove of timeʼ, proclaiming it to be the deﬁnitive quality of contemporary constituent power? Radical Calvinist ascesis deﬁned the fallen condition as a privation of continuity. Or, more precisely, not of continuity itself but of its accessibility, its objective availability in the sense that objects of study are made available to the subject of techno-scientiﬁc knowledge. What remains when every such spatialized representation of continuity is renounced resembles ʻtendencyʼ in Henri Bergsonʼs sense: continuity of transformation (or, in Negriʼs terminology, of ʻcrisisʼ) itself. Motion, as Bergson showed, is indivisible, and what is continuously transformed is the very relation between subject and object. This understanding of process (or ʻprocedureʼ, which Negri privileges over ʻmeasureʼ in absolute terms) undermines the basis for any ʻscientiﬁcʼ interpretation of past events and any attempt to quantify and ʻmanageʼ risk. ʻAsceticʼ love of time means forever being called upon to destroy and reinvent not only the objective world but oneʼs own subjective position as well. For all Negriʼs antidialectical polemic and his afﬁrmation that ʻwe are beyond Marxʼ, the image of the proletariat as the class whose historical task is its own abolition cannot fail to resonate here. 3. ^ Unless the Trotskyist hypothesis of an originally pure workersʼ state which ʻdegeneratedʼ at some later date is accepted, it must be assumed that capitalist practices were at least present if not dominant in the USSR from the outset. If this tendency only fully revealed itself with the reintroduction of Taylorism and one-man management, these moves were essential elements of the drive towards industrialization which had always been the Bolsheviksʼ priority. 4. ^ Negri, Insurgencies, p. 299. 7. ^ The term ʻcivil societyʼ has recently been widely used with reference to NGOs and nonviolent ʻprotestʼ and lobbying groups. This designation unintentionally reveals the complicity of these subjects as mediators between state institutions and subaltern multitudes – the paradigm for this role is of course the trade union. Negri and Hardt show how, media epiphenomena notwithstanding, the function of precisely this ʻcivil societyʼ is disappearing with the real subsumption of society in capital and the (transnational) state. Michael Hardt and Antonio Negri, Labor of Dionysus, University of Minnesota Press, Minneapolis and London, 1994. 8. ^ Negri, Insurgencies, p. 33. 9. ^ For a concise, recent statement of this recurring argument in Negriʼs work of the last twenty years, see Part 3 of Labor of Dionysus. Another of the numerous texts elaborating the concept of ʻimmaterial labourʼ is the essay ʻLavoro immateriale e soggetivitaʼ, co-written with Lazzarato, in the ﬁrst issue (numero zero) of the Italian journal DeriveApprodi (www.deriveapprodi.org), which also published Berardiʼs recent book La Fabbrica dellʼ infelicita. New economy e movimento del cognitariat. 10. ^ Giorgio Agamben, Homo Sacer, trans. Daniel HellerRoazen, Stanford University Press, Stanford, 1998, ch. 4. 11. ^ Negri, Insurgencies, p. 184. 13. ^ Ibid., p. 135. 14. ^ Ibid., p. 134. 15. ^ These elements of Bergsonʼs thought are explored with great delicacy in a forthcoming book by Gregory Dale Adamson. Plenary One: Marxism and Cultural Practice Today Plenary Two: Art or Aesthetics? Methodology; Marxism and Aesthetic Value; Cultural Heritage of the Soviet Bloc; Technology, Commodiﬁcation and Cultural Form; What Is Living and What is Dead in the Situationist International? ; Stages in the Popular; Racialization, Gendering and Sexing of Class; Psychoanalysis and Materialist Theories of the Subject; Cultural Production in 2nd World and 3rd World Countries; Sociology of the Contemporary Art World. 8-10 APRIL 2002 UNIVERSITY COLLEGE LONDON The decisive impact of materialist cultural theories in the humanities (literary studies, art history, ﬁlm studies, cultural studies) in the 1970s is widely acknowledged. This interdisciplinary conference has been organized to reconsider those critical legacies in the light of the vast changes of the recent past, speciﬁcally the collapse of Soviet communism and the dramatic repercussions of globalization. Rasheed Araeen, Viktor Arslanov, Michael Baldwin, Anne Barron, Caroline Bassett, Matthew Beaumont, Dave Beech, Kirsten Buick, Warren Carter, Mary Coffey, Geoff Cox, Gail Day, Angela Dimitrakaki, Steve Edwards, Stephen Eisenman, Josephine Gear, Thomas Gretton, Nicos Hadjinicolaou, Sharon Harper, Michael Hatt, Jutta Held, Andrew Hemingway, Sean Homer, Anselm Jappe, Paul Jaskot, Boris Kagarlitsky, Christina Kiaer, Barry King, Esther Leslie, Stewart Martin, Drew Milne, Stanley Mitchell, Peter Osborne, Giles Peaker, Satish Padiyar, Alex Potts, John Roberts, Gregory Sholette, Peter Smith, Abigail Solomon-Godeau, Julian Stallabrass, Frances Stracey, Wojciech Tomasik, Alan Wallach, Ben Watson, Otto Karl Werckmeister, Chin-tao Wu, Slavoj Zizek. Whole programme: £75 (student/unwaged: £30); day: £40 (student/unwaged: £17.50). PLACES ARE LIMITED, SO PLEASE BOOK EARLY TO AVOID DISAPPOINTMENT For booking forms contact: Nick Grindle, Department of History of Art, University College London, Gower Street, London, WC1E 6BT, UK; tel: 020 7679 7548; email: n.grindle@ucl.ac.uk The conference is sponsored by: Department of History of Art, University College London and School of English and Humanities, Birkbeck College, University of London. It is in association with Historical Materialism.